About two-thirds of our databases, streaming video sites, and eBook Central require you to log in. You will need your student/staff/faculty ID to do so. 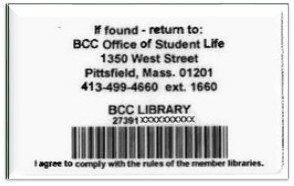 Student ID's are made in the Library during our regular scheduled hours, and your initial ID is free. Replacement IDs are $5.00. The backside of your ID contains your library barcode, beginning with 27391.... This is your USERNAME. Your PASSWORD is initially your last name in UPPER CASE. This can be changed, if you choose to do so. When you pick many of our database from our A-Z list, or choose one of our other licensed products, such as eBook Central, Medcom or Films On Demand, you will be prompted to enter your USERNAME (your barcode) and PASSWORD (your last name in CAPITAL LETTERS) into a template. Students only may use their email address up unto the @ sign. If you are taking an online only class and reside outside of Berkshire County, you can apply for an online Username and Password. You will need to be verified as being currently enrolled in a BCC class and all communication will be through your BCC email address. Contact the Library for further information at 413-236-2150 between 8:00 am and 3:00 pm.